Faculty and administrators from a Chinese technical school traveled to NMC for training earlier this month, another milestone in a one-of-a-kind international partnership that is now rounding the midpoint of its first stage. 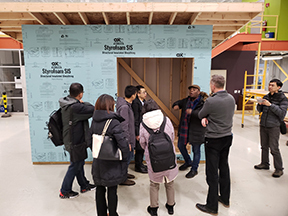 NMC and the Yellow River Conservancy Technical Institute have an agreement under which NMC instructors teach construction and marine technology classes to three cohorts of Chinese students in China. The first cohort of about 50 earned their NMC degrees in spring 2018, the first time a community college had delivered a technical, applied program internationally. The second cohort will wrap up this spring. After the third cohort completes in 2020, NMC will consider whether and how to move forward with student exchanges. Key to advancing the partnership is joint professional development. On this month’s orbital pass, Yellow River instructors visited NMC’s Aero Park campus for training on marine technology and construction technology equipment. On the marine technology side, Yellow River recently purchased the same underwater ROV that NMC owns for their campus in Kaifeng, China. 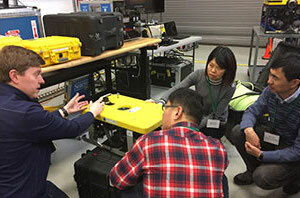 NMC instructors will be able to use the ROV when they return to China in April for the fourth of six planned instructional delivery sessions. NMC facilitated shipment of equipment within China for the previous cohort. Yellow River is also investing in sonar equipment and software. Instructors will return to Traverse City in June for additional training. “They are really taking our support and building out a degree,” said Van Sumeren. He added that NMC’s new land surveying degree, offered beginning this fall, was informed by Yellow River. The Institute has the largest surveying program in China. On the construction side, the Chinese group was introduced to both hand and power tools used in basic carpentry. “Most of their equipment all has to do with concrete,” said Dan Goodchild, Construction Technology coordinator. Instructor Brian Sweeney will make his third trip to China this spring to teach construction courses. He says the challenge of teaching internationally has made him a better teacher at NMC. “I go with the assumption they will not understand anything I say. Everything has to be presented visually or hands-on,” said Sweeney, who teaches in English with the support of a team of four interpreters. That habit has translated back to his classes in Traverse City. “I put a lot more pictures in my presentations, because that seems to be the best way to transmit information,” Sweeney said. NMC began the partnership with Yellow River in 2012 as part of the strategic directions determined by the college Board of Trustees to prepare learners for success in a global society, establish international competencies in the area of freshwater and deliver learning through a networked workforce.